Here’s an extra w/b Ocean at Truro NS yesterday afternoon Dec 27/14. Excellent pictures! No snow down east either! Can you tell me what the make up of the train was? And to put a historic twist on it......the Diner is "Acadian" and the Park Car "Evangeline"
Very nice - thanks for sharing the photos and the consist. I remember back in the 90s taking the train home from school (Montreal to Moncton) and it wasn't unusual to see 25-30 cars. The solid Budd Stainless-Steel is certainly nice to look at especially in a snowy landscape but for a smooth & quiet ride and comfort……I think I’ll stick with a Renaissance Deluxe Double Bedroom (or Cabin for 2) along with view from the Park Car……And it’s nice to see VIA will now be offering Sleeper Plus Class (with meals included) year ‘round on the Ocean. Maybe it's just me, or pure Nostaligia (as before 2009, I never took a renaissance car) but I've always felt that these old Steel cars are more comfortable. Dunno why. Still, good pics you took there! NeoArashi wrote: Maybe it's just me, or pure Nostaligia (as before 2009, I never took a renaissance car) but I've always felt that these old Steel cars are more comfortable. Dunno why. Still, good pics you took there! It's not just you....I've spent a lot of time in both types of equipment (in coaches and sleeper for both), and I can say hands-down that the Budd equipment is much more comfortable. Overnight in the coaches, the Budds are a whole world better than the Rens. Sure no single seats, but so much easier to actually sleep. And when it comes to beds in the sleepers, there's no comparison: the Budds are far, far more comfortable. Not nostalgia speaking on my part, because my first several trips on the Ocean were in the Renaissance cars and I was generally okay with them....until I finally got to experience the trip in the Budds! I've met plenty of people on board who have shared exactly the same sentiment, so it's always nice to see them back. I was very particular to book travel on that equipment both ways for my Christmas travels this year. Note that all 4 coaches are among the HEP1 cars that came second hand from various American origins, rather than the ex-CP stock. A bit unusual, as we've normally had a mix of both types in past years. Maybe difference in perceived ride quality is a function of running coaches designed for 140mph over track maintained to the least CN can get away with? dowlingm wrote: Maybe difference in perceived ride quality is a function of running coaches designed for 140mph over track maintained to the least CN can get away with? The ride quality in the Rens is actually generally quite good, as long as the suspension is working well (and because it's an air suspension system, there are often failures in the very cold parts of the winter....then it's a scary ride! ), while the Budds do rattle and bounce a bit more. My feelings on "comfort" have everything to do with the actual interior design, i.e. seats, beds, layout/orientation, room dimensions, etc. that make the Budds much more enjoyable, as well as the other amenities (like domes, proper lounges, proper diner, etc) that add to the better experience. In that case, I will be looking forward my Montreal-Jonquiere trip this friday. 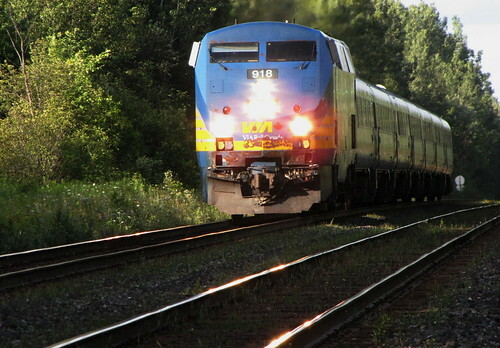 IIRC, The Montreal-Jonquiere-Senneterre trains still ONLY use Steel budds, right? I hope that my Quebec Montreal trip a day before (this thursday) will be in a Steel budd as well, though it's very unlikely as the only time I've ever been in a steel budd for a corridor trip was for an afternoon getaway to Alexandria from Montreal, back in November 2011, and even the return trip (in late afternoon) was in a renaissance car. Not hating on the renaissance cars, they are still plenty comfortable, but the Steel Budds are just much better. Think I'll stick with the Budds for photography.......and the Rens for riding! Regarding room dimensions, I will take a Ren. cabin any day over a "cabin for 1", formerly known as a roomette. After my first trip in a Renaissance bedroom I never wanted to travel in a roomette again. Most of my recent trips on the Canadian have been on Preference points, so I rough it in a roomette. (VIA charges double points for a cabin for 2 - whether occupied by one or two passengers.) My wife and I frequently booked a drawing room (now called a cabin for 3) for our travels. Neither of us has any fondness for an upper berth! A few years ago VIA made drawing room tariffs full fare only, although a 10% seniors discount applies, but no discounts for booking in advance and Preference coupons cannot be used because there are no drawing rooms in the Discounted fare category. Except for one time two years ago when we splurged on the Park car drawing room on the Ocean, drawing rooms are history for us - (sniff). So that leave us the choice of taking a double room or two roomettes in the Budd sleepers. Neither is an appealing choice.Two adjacent double rooms is way too expensive. Single occupancy of a Ren. sleeper costs a mere 15% above the per person rate. If using points, there is no surcharge for single occupancy of the Ren. rooms because there are no roomettes. So two people travelling on points can have two rooms for the same points as sharing one room. So on the Ren. Ocean we can have two rooms at a very reasonable fare, whether paying the advance Discounted fare or using Preference points or the 50% discount coupons. While it is true the Ren. beds are not as comfortable as on the Budd sleepers (the beds are four inches narrower but slightly longer) the benefits of having more space, a larger toilet annex, a private shower for a small surcharge (no surcharge for a cabin with shower if using Preference points) and cabin doors that can be locked when you leave the room outweighs the disadvantages.